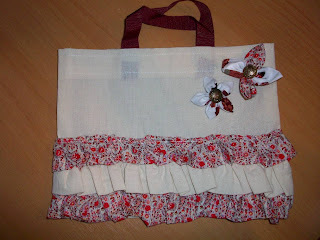 365 DAYS OF PINTEREST CREATIONS: day 160: christmas gift bag with ruffles! day 160: christmas gift bag with ruffles! 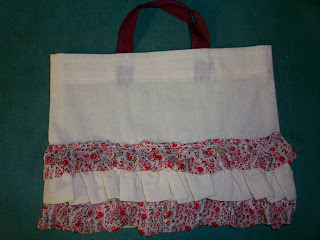 the completed ruffle gift bag! 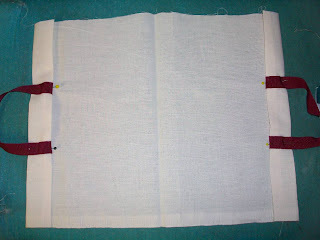 day 160 and i am back to the sewing machine again today. today i have chosen to make a christmas gift bag with ruffles! 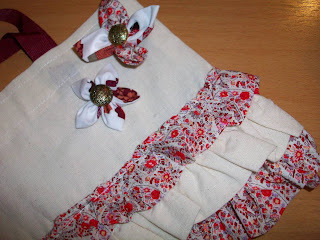 i keep seeing these gorgeous ruffle bags on pinterest and have been so inspired to make one as a holdall. before i attempt something like that i wanted a creation to practice with and i thought a christmas gift bag would be perfect. is to sew up the sides ... easy aye! the attached ruffles .... this was HARD work! outcome: ruffles on a bag are so much harder than they look. it is really hard to get a straight line when your ruffles want to curve all over the show! if i were to make this again i wouldn't bother with the unfrayed edges as that just added to the stress! in the end i am really chuffed with this bag, but to make another like this probably won't happen in the near future, it was a lot more work than i anticipated! Super cute! Love the flowers too. Kept meaning to tell you that last week was the World Rugby Classic in Bermuda. On the opening night the All Blacks beat the Eagles (USA) 39 - 0! Everyone was impressed by the slaughter but then the second game of the night was even more of a killing - the Lions beat the Italians 83 - 5!! Those ruffles do look like hard work! Well done you! I think the hardest part would be sewing them onto the bag AFTER the bag has been put together. If it was me, I'd leave the bottom of the bag open to make it easier (obviously this one has a fold for the bottom, so that would need to be changed). 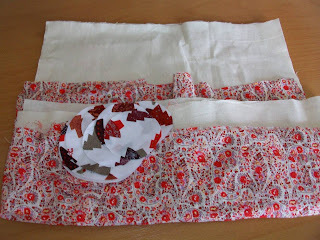 And to get the ruffles 'just right', you could possibly attach the ruffles first of all to some ribbon or tape, and then sew the nice straight flat ribbon/tape onto the bag. that's so cool about the AB's Jen! Damn Lions upstaging us ;) what i really need is for jen, nadine, and jenny all to come for december so i can become a crafting genius! if i win lotto over the coming weeks i will let you know so i can pay for you all to come!